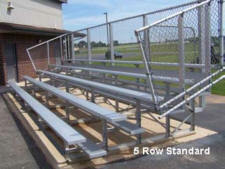 Our "Standard" non-elevated aluminum bleachers provide an affordable bleacher seating system for outdoor use. All "Standard" bleachers include 2"x10" anodized seat plank, single (1) 2"x10" mill finish foot planks on rows 2-3 and double (2) 2"x10" foot planks and riser plank on rows 4 and above. Great for schools, baseball and football fields. Guardrails are included on all systems with 5 rows of seating or more. 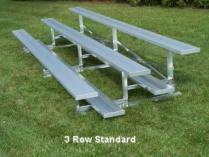 Our 3 row bleachers top seat height is under 30" so guardrail and riser are not required to meet building and safety codes. Features listed below may be required to meet local code. Always check with your local building department. "Standard" suffix S on the end of our model # refers to the system having a single (1) 2"x10" foot plank onrows 2- 3 and double (2) 2"x10" foot planks and riser plank on rows 4 & up. Guardrails are included on all systems with 5 rows of seating or more. "Preferred" suffix P on the end of our model # refers to the system having all the features of our "Standard" model plus double (2) 2"x10" foot planks on all rows. "Deluxe" suffix D on the end of our model # refers to the system having all of the features of our "Preferred" plus riser planks on all rows and aisle(s) with handrails. Large selection of bleachers for sale;�; outdoor, aluminum sets that can also be used at indoor gyms, natatorium's , & rec centers. Volume discounts & Fast Shipping !